It's always tricky choosing the winners at a show like MWC, as there's always a glut of immensely beautiful, powerful and innovative phones to check out. It certainly wasn't any easier this year, as improved design from Samsung, more power from HTC and a couple of new polished smartwatches from LG showed the big players were still really active at the year's biggest phone launchpad. On top of that there was some cool stuff from Nokia, loads of new virtual reality headsets and a bundle of new fitness gadgets to check out. In short, a busy, sleepless time for the intrepid bunch of TR journalists trekking around the Barcelona halls, but some great contenders for the TechRadar Phone Awards 2015. What the judges said: "While it was great to see loads more wearables than just smartwatches at the show this year, they still made a big splash with improved design and specs. However, the sheer awesomeness of the HTC Vive makes it a clear winner for this category." What the judges said: "It's tough to separate the smartwatches, as many of those in this nascent category are rather similar. However, the Pebble Time Steel's improved design, great battery life and more open compatibility saw it edge ahead of the LG Watch Urbane, which came close thanks to a beautiful new frame for Android Wear." What the judges said: "The Sony Xperia Z4 Tablet was the clear winner here, providing a credible threat to the iPad Air 2 thanks to a big upgrade in weight, power and screen resolution – plus a nifty 'laptop mode' too. That said, the Nokia N1 was a dark horse in this category (backed up by Deputy Editor John McCann's piece proclaiming it to be his favourite tablet) combining Android with Apple-worthy design. What the judges said: "The Samsung Galaxy S6 Edge was an easy winner in this category, offering the best fusion of design, specs and performance the South Korean brand has ever managed, and Editor Gareth Beavis describing it as a 'Spacephone', such were its futuristic leanings. However, the One M9 impressed with its raw power and refined style, and the Sony Xperia M4 Aqua manages to masquerade well as a flagship-looking phone with a mid-tier price. What the judges said: "The public was pretty clear in what it liked the look of here at MWC: the Samsung Galaxy Edge, with barely any love for the regular version. However, the HTC One M9 also picked up a lot of interest, with the iterative design change still proving enough to attract many. What the judges said: "The Samsung Galaxy S6 Edge should have had a simple run to a hat trick of titles, but the sheer impressiveness of HTC and Valve's VR partnership meant a phone wasn't the most exciting thing at the show this year. 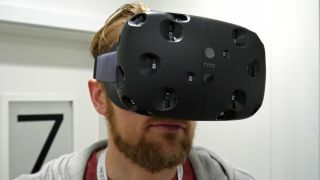 "It has to be experienced to be truly believed, but the 3D movement in space – combined with improved clarity and interactivity – means the HTC Vive has pushed VR onto the next level. "Qualcomm's Sense ID deserves plaudits for its ability to make fingerprint scanning more accurate and easy to use, and Ikea's plan to Trojan Horse wireless charging into homes bodes well for the futuristic phone charging method." Read more of our MWC 2015 coverage.